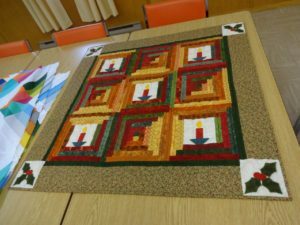 A good number of ladies attended yesterday, and a lot of work and chatting got done. 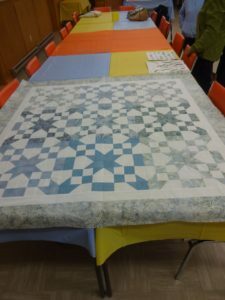 Nancy McH brought her large queen size quilt that she has finished hand quilting! She worked hard all winter to get it done. A few of us helped her choose the binding fabric. 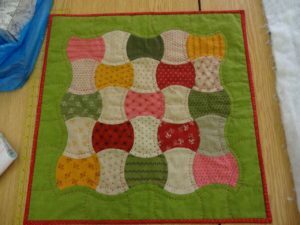 Mary H. brought her hand-pieced and hand quilted (with large stitches) hanging in the Apple Core pattern. 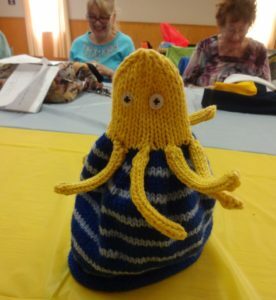 Hilda was knitting a cute hat with an octopus on top, Nancy mcH had a lovely hand painted wooden bowl from Joan F, and I brought a kid’s quilt top (I Spy) to send on to Ft. McMurray, AB, when the time is right. At coffee time Mary H. discussed the show, and passed around a sign up sheet just for an idea of how many items we might have on display. I will be circulating printed forms for more formal registration of items, and Nancy will print up the tags for the items. Beverley Parker will chair the refreshment committee. Mary will circulate a schedule to make sure the kitchen and admission desk are covered. 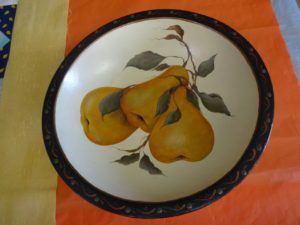 We also discussed the small room, and it was agreed that it would house a small memorial display to honour Gladys Leighton, and the other part of the room would be a display and explanation of “Tools of the Trade”….. gizmos that members find particularly helpful with their craft. So be thinking about what you can contribute to that effort please. We also decided that we will continue the 9:30 am start to our gatherings on Thursday, as more people come then than at 9 am as we have done in the past. We had a good crowd out today, and were especially glad to see Nancy McH. and Linda K, among others. 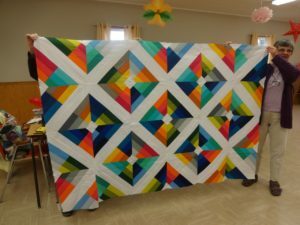 Had several show and tell quilts, photos are below. There was one other, but my photo was very blurry, so will try to include it at a later date. 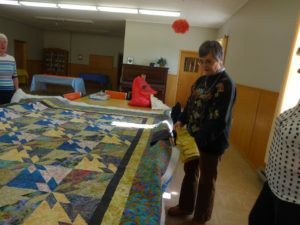 Lots of knitting going on, and Dawn was working on the binding of her quilt for the Museum fundraiser this year. 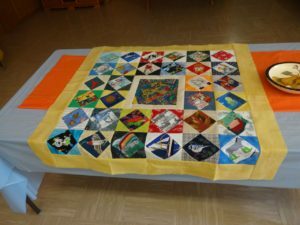 Some of us also discussed giving our “crisis quilt” that we made 2-3 years ago to the Ft. McMurray fire victims, once we know where to send it and when. It will be a while before people get back there, and we will have to play our donation by ear. 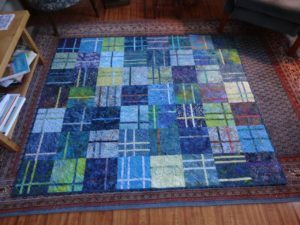 The new Facebook page, New Brunswick Quilters Gather, has something on this, and I suspect more organization details with be forthcoming over the next week or so. 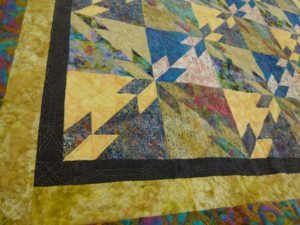 If you have a quilt other than our guild quilt that you wish to send along, let me know, and I will let you know the details as I learn about them. We are thinking of Peg who was scheduled for back surgery today.